In the last issue, we discussed some of the primary factors that affect the efficiency of a walk-in cooler. In particular, we discussed how the evaporating and condensing temperature of a system plays a significant roll in the efficiency. For example, let’s consider a -5°F walk-in freezer that is 20’ x 10’ x 10’ high. A typical load for this type of freezer would be in the 13,000 Btu/h range and we will use R448A as a refrigerant in our examples. First, let’s consider the condensing unit selection. The size of the compressor depends on both the evaporating temperature and the condensing temperature. Fig. 1 illustrates the range we could expect to see for our example freezer. 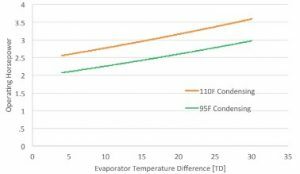 As you can see, for a 110°F condensing temperature (approximately 95°F ambient) we would operate between about 2.75 and 3.25 HP in the “normal” range of evaporator temperature difference (TD) – 10F to about 20F. This is significant because at these sizes, compressors are often available in increments of 1/2 horsepower. Selecting a lower TD could result in a smaller condensing unit and a lower cost for that unit. In this case, if you were to design based on a TD of 10°F, you would likely end up choosing a 3 HP condensing unit. If you were designing to a 20°F TD, you would likely end up choosing a 3.5 HP condensing unit. Figure 1. Approximate operating energy required for the example condensing unit at two different condensing temperatures. Figure 1 also illustrates the significant difference between operating the condensing unit in a cooler environment. A 95°F condensing temperature could be expected in an ambient of approximately 80°F and decreases the horsepower requirement by about 20 percent. This would be achievable in a location such as an air-conditioned space or a large unconditioned crawl space. Digressing slightly, if it is an air-conditioned space you should consider that you are likely moving the heat using the air conditioner, which will increase its energy use at least during the summer. Figure 2. Operating horsepower, including evaporator fan, compared to evaporator TD. Note that this is only peak energy use and does not account for the fact that in almost all cases, the evaporator fans operate for longer periods of time than condensing units. On the flip side, the heat the condensing unit rejects may reduce the heating requirement for the building in the winter. In any case, the point is that it is imperative for efficiency purposes to avoid hot locations like unventilated ceiling spaces, roof enclosures with poor circulation or unconditioned kitchens. Continuing with our example of the 13,000 btu/h unit operating at 110°F condensing, it is obvious that the condensing unit is only part of the picture and that we also must consider the energy use of the evaporator. Fig. 2 shows the added fan horsepower to the total peak power of the equipment. Notice that at very low TDs, the fan horsepower increase is significantly more than at the higher TDs. Since fans typically run 24 hours/day regardless of the refrigeration load; this has a much more dramatic effect on the energy use of lower TD systems. A proper energy analysis would show that some lower TD systems actually use more energy unless additional evaporator controls, such as fan speed controllers, are employed. Figure 3. The load of our example walk-in freezer based on wall, floor and ceiling insulation thickness. Additionally, the lower TD evaporators require much more surface area and more fans, so are more expensive. The difference, in this case, would move us from a single fan at a TD of 25°F to 5 fans at 5°F TD! The point of this exercise was to illustrate that there are many entangled parameters to consider when choosing energy efficient and cost-effective refrigeration systems for walk-in coolers and freezers. There are several other issues to consider regarding the equipment; however, we are going to shift our focus a bit to a few other “secondary” parameters. The first parameter I want to discuss is the selection of insulation thickness for the walk-in panels (or the decision to use field-built walls). Fig. 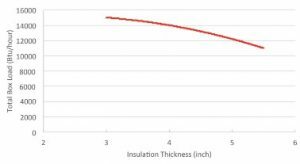 3 shows what the difference would have been to our example system based on wall thickness; it shows a 20 percent change in the total box load between a selection of three-inch insulation compared to five-inch. When I started in the industry we used three-inch panels for a lot of systems, including freezers. Over the years the use of four-inch panels has grown and it’s fairly common to see five inches. It is also important to consider that different types of insulation have different insulating values and they degrade differently over time. While the point here is not to get carried away discussing box insulation, it is worthwhile considering that in addition to increasing efficiency, the increased insulation may also reduce the size of equipment you need. The last parameter I want to discuss is pipe sizing. It is disappointing to walk on to a job where you can tell that care was given to selecting good box panel insulation and refrigeration equipment only to find the pipe sized so small that any efficiency gain is completely lost. 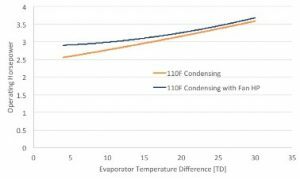 We previously covered the effect of evaporating temperature on efficiency and we are going to focus on the suction line sizing to illustrate why proper pipe sizing is so important. In our example, the required capacity of the system was 13,000 Btu/h. Let’s assume that we used the 3 HP condensing unit at a 110°F condensing temperature and selected an evaporator that resulted in a 10°F TD (-15°F evaporating temperature). At these conditions, the expected power consumption would be approximately 2.74 HP. Fig. 4 illustrates the effect on the horsepower consumption from pipe size selection. As you can see, for a very short pipe run, there is almost no difference in energy use between 3/4” and 1-1/8” tubing. You can also see that the same results do not hold for a longer pipe run where the difference between 3/4” and 1-1/8” results in an eight percent increase in energy use. This effect results in the inefficient operation of a significant portion of systems. Notice that it is the equivalent length that is used to determine the piping pressure drop. This means that an equivalent length should be added for all components and directional changes (bends, valves, 90s, etc…. ), which makes it difficult to have a system that is only 20 equivalent feet. It’s not hard to imagine, with all the parameters that can affect the energy use of a walk-in cooler or freezer, that many operate inefficiently. This has resulted in an effort to standardize energy efficiency regulations in the U.S., which has adopted several energy efficiency measures that require certain minimum product specifications (i.e. insulation thicknesses) and minimum refrigeration system efficiency. This minimum efficiency is being determined by a U.S. Department of Energy (DOE) test method called the Annual Walk-In Efficiency Factor (AWEF). One of the things we did not discuss in this article that can have a large bearing on the efficiency of a refrigeration system is the refrigerant selection itself. As we move to reduce the environmental impact of refrigerants, there is sometimes a conflict between the desire to reduce energy use directly and reducing the overall environmental impact. CO2 often ends up in this conflict because in high ambient conditions it is not very efficient. However, the direct global warming potential (GWP) of the refrigerant is very small so the overall impact might actually be lower depending on how power is produced in the area the system is installed. This is perhaps a conversation for another day.